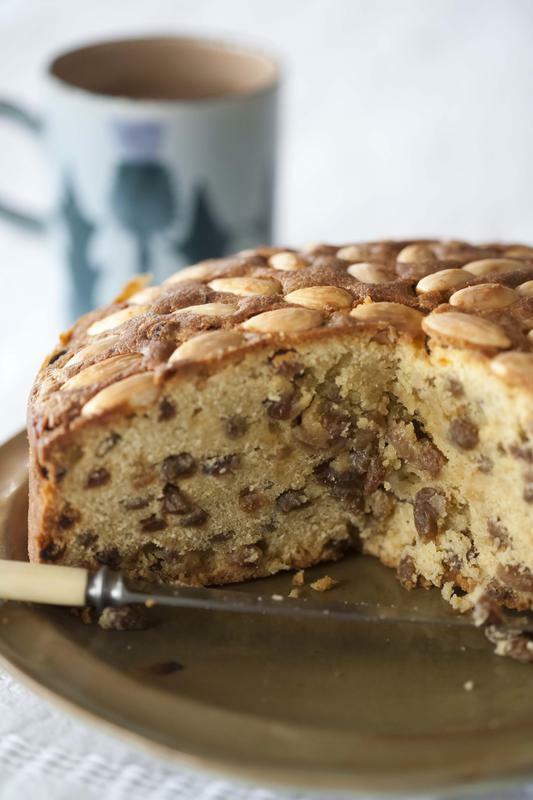 The Dundee cake proudly bears a wreath of golden almonds, like an insignia, denoting its authority in the fruit cake world. Its origins are linked with the early Scottish marmalade industry. The Keiller family - pioneering and resourceful marmalade-makers - used factory downtime to make this legend of the Scottish tea table. The original recipe used only sultanas and lots of orange peel. These days, commercial recipes seem to favour a rich mix of vine fruits and cherries. Bring the sultanas back to life by placing them in an ovenproof dish, pouring over the whisky and covering the dish with foil. Place in a very cool oven – say 130°C /Gas mark ½ – and leave for 30 minutes to allow the whisky to warm and moisten the fruit. In a mixing bowl, beat the butter and orange zest to a cream. Add the sugar and beat thoroughly until light and creamy. Add the eggs, one at a time, adding 1 tbsp of the flour with each and beating thoroughly before adding the next. Sift the remaining flour and salt over the mixture and fold in, using a metal spoon. Finally fold in the ground almonds, whisky-soaked sultanas and the marmalade or peel. Spoon the mixture into the prepared tin, spreading it out evenly with the back of the spoon. Lightly place the whole almonds on top of the cake, starting from the outside, and working towards the centre in ever-decreasing circles. Bake in the oven for about 1½ hours until a skewer inserted in the centre comes out clean. Check after 1 hour and, if the surface is getting too brown, lay a piece of foil over the top. Wrap in greaseproof paper and store in an airtight tin. It will keep for 6 weeks.